Dear readers interested in the treatment of young children with bipolar disorder and multiple other symptoms: In 2017, BNN Editor Robert M. Post and colleagues published an open access paper in the journal The Primary Care Companion for CNS Disorders titled “A Multi-Symptomatic Child: How to Track and Sequence Treatment.” The article describes a single case of childhood-onset bipolar disorder shared with us via our Child Network, a research program in which parents can create weekly ratings of their children’s mood and behavioral symptoms, and share the long-term results in graphic form with their children’s physicians. Here we summarize potential treatment approaches for this child, which may be of use to other children with similar symptoms. We present a 9-year-old girl whose symptoms of depression, anxiety, attention-deficit hyperactivity disorder (ADHD), oppositional behavior, and mania were rated on a weekly basis in the Child Network under a protocol approved by the Johns Hopkins School of Medicine Institutional Review Board. The girl, whose symptoms were rated consistently for almost one year, remained inadequately responsive to lithium, risperidone, and several other medications. We describe a range of other treatment options that could be introduced. The references for the suggestions are available in the full manuscript cited above, and many quotes from the original article are reprinted here directly. As illustrated in the figure below, after many weeks of severe mania, depression, and ADHD, the child initially appeared to improve with the introduction of 4,800 micrograms per day of lithium orotate (a more potent alternative to lithium carbonate that is marketed as a dietary supplement), in combination with 1 mg per day of guanfacine, and 1 mg per day of melatonin. Despite continued treatment with lithium orotate (up to 9,800 micrograms twice per day), the patient’s oppositional behavior worsened during the period from November 2015 to March 2016, and moderate depression re-emerged in April 2016. Anxiety was also generally less severe from December 2015 to July 2016, and weekly ratings of overall illness remained in the moderate severity range (not illustrated). In June 2016, the patient began taking risperidone (maximum dose 1.7 mg/day) instead of lithium, and her mania improved from moderate to mild. There was little change in her moderate but fluctuating depression ratings, but her ADHD symptoms got worse. The patient had been previously diagnosed with bipolar II disorder and anxiety disorders including school phobia, generalized anxiety disorder, and obsessive compulsive disorder. 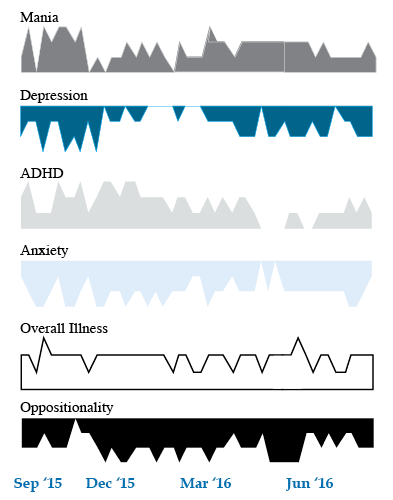 Given the six weeks of moderate to severe mania that the patient experienced in October and November 2015, she would meet criteria for a diagnosis of bipolar I disorder. General treatment goals would include: mood stabilization prior to use of ADHD medications, a drug regimen that maximizes tolerability and safety, targeting of residual symptoms with appropriate medications supplemented with nutraceuticals, recognition that complex combination treatment may be necessary, and combined use of medications, family education, and therapy. None of the treatment options in this section are approved by the US Food and Drug Administration for use in children under 10 years of age, so all of the suggestions are “off label.” Further, they may differ from what other investigators in this area of medicine would suggest, especially since evidence-based medicine’s traditional gold standard of randomized placebo-controlled clinical trials is impossible to apply here, given the lack of research in children with bipolar disorder. As we share in the original article, reintroducing lithium alongside risperidone could be effective, as “combinations were more effective than monotherapy in a study [by] Geller et al. (2012), especially when they involved an atypical antipsychotic such as risperidone. This might include the switch from lithium orotate to lithium carbonate,” the typical treatment for bipolar disorder, on which more research has been done. “Combinations of lithium and valproate were also more effective than either [drug alone]…in the studies of Findling et al. (2006),” and many patients needed stimulants in addition. “Most children also needed combinations of mood stabilizers (lithium, carbamazepine, valproate) in the study [by] Kowatch et al. (2000).” In a 2017 study by Berk et al. of patients hospitalized for a first mania, randomization to lithium for one year was more effective than quetiapine on almost all outcome measures. “The anticonvulsant mood stabilizers (carbamazepine, lamotrigine, and valproate) each have considerable mood stabilizing and anti-anxiety effects, at least in adults with bipolar disorder. With inadequate mood stabilization of this patient on lithium and risperidone, we would consider the further addition of lamotrigine. “Carbamazepine appears to be more effective in adults with bipolar who have [no] family history of mood disorders,” unlike lithium, which seems to work better in people who do have a family history of mood disorders. “While the overall results of oxcarbazepine in childhood mania were negative, they did exceed placebo in the youngest patients (aged 7–12) as opposed to the older adolescents (13–18) (Wagner et al. 2006). “There are long-acting preparations of both carbamazepine (Equetro) and oxcarbazepine (Oxtellar) that would allow for all nighttime dosing to help with sleep and reduce daytime side effects and sedation. Although data [on] anti-manic and antidepressant effects in adults are stronger for carbamazepine than oxcarbazepine,” there are good reasons to consider oxcarbazepine. First, there is the finding mentioned above that oxcarbazepine worked best in the youngest children. Second, there is a lower incidence of severe white count suppression on oxcarbazepine. Third, it has less of an effect on liver enzymes than carbamazepine. However, low blood sodium levels are more frequent on oxcarbazepine than carbamazepine. At a recent scientific meeting, researcher Andrew H. Miller presented data on infliximab, an inhibitor of the inflammatory cytokine TNF alpha that is used to treat rheumatoid arthritis and is being explored for the treatment of depression. As previously reported in BNN Volume 16, Issue 2 from 2012, the drug was not effective overall among the depressed patients, but in a subgroup of patients with high levels of the inflammatory marker CRP, infliximab was highly effective. Miller emphasized that patients do not fail to respond to treatments; it is doctors who fail, or drugs that fail. He explained that there is tremendous heterogeneity in people’s illnesses, and doctors must get better at sorting out what treatments will work for each patient, striving toward personalized therapeutics. There are many clinical correlates or predictors of nonresponse to antidepressants used in unipolar depression. These include inflammation, obesity, stress in childhood, anxiety disorder comorbidity, substance abuse comorbidity, and medical comorbidity. Editor’s Note: How do we doctors target these clinical correlates of illness for better therapeutic effects? We are just starting to learn, and until we identify good markers for predicting illness, the best we can do is carry out carefully sequenced clinical trials of medications and therapies with different mechanisms of action. Patients can assist their physicians and clinicians by engaging in precise, preferably nightly charting of their mood, functioning, medications, life events, side effects, and other symptoms such as anxiety on a personal calendar. Several of these are available for free download, and there are other longitudinal screening instruments, such as the website and app What’s My M3. A good personal response to a novel treatment or a poor response to an Federal Drug Administration–approved treatment trumps anything that is written in the research literature. The best way to achieve the best outcome is to engage in excellent monitoring of symptoms and side effects that can guide the next steps in therapeutics. 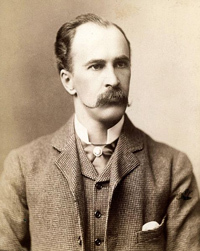 Clinical medicine is an art and as medical pioneer Sir William Osler declared, often involves “skillful use of combinations.” As the risks of inadequately treated illness increase, use of drugs with inadequately delineated benefit-to-risk ratios may be increasingly justified, such as in the case of memantine as recommended by Koukopoulos. One should start early, effective, preventive pharmacological treatment of the recurrent unipolar and bipolar disorders. When this is not accomplished, an increasing number of unknowns enter the treatment equation, and as these illnesses enter more serious stages of recurrence, progression, and treatment resistance, the path to remission and wellness becomes increasingly complicated and relies on skillful management, guesswork, and good data from patients. 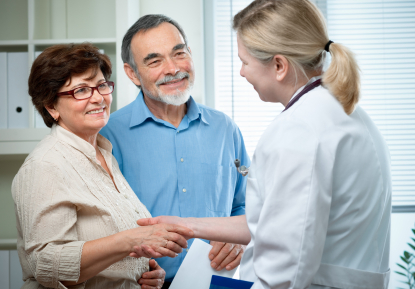 Given the multiple unknowns, patients can play an important role. They can be intimately involved in the decision-making, and provide precise feedback in the formal or informal longitudinal monitoring of mood, sleep, other symptoms, and side effects so that whatever is tried can be accurately assessed. A treatment with known efficacy is only worthwhile if it is effective in a given patient. When evidence of efficacy in the literature is more questionable, the evidence of effectiveness of a given treatment regimen in a given individual becomes all the more important to discern. We recommend that patients chart their mood and medications using the National Institute of Mental Health’s Life Charting Method (NIMH-LCM) or another type of personal calendar (we offer several on our Lifecharting page–see the gray horizontal menu above this article). This type of careful longitudinal monitoring method can help in the quest for an optimal treatment result. Our old recommendation would appear particularly appropriate for this discussion. When things are going well (in the treatment of recurrent mood disorders), be conservative and stay the course. Conversely, when mood is not stabilized, be more radical and continue to explore new options until stability is achieved. If you have unipolar depression or bipolar disorder and are having trouble stabilizing your mood, we recommend nightly charting of mood, medications and side effects on the easy-to-use Monthly Mood Chart Personal Calendar (pictured below) or the National Institute of Mental Health Life Chart (NIMH-LCM), both of which are available for download. Click on the Life Charts tab above to download the personal calendar, which includes space for rating mood, functioning, hours of sleep, life events, side effects, and other symptoms such as anxiety. 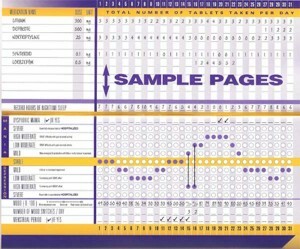 Then bring the chart to each visit with your physician to help in the assessment of treatments. Life charting can help determine which medications are working partially and need to be augmented further, and which need to be eliminated because of side effects. Since there are now many potential treatments for depression and bipolar disorder (some FDA-approved and some not), a careful assessment of how well each new treatment works for a particular patient is essential to finding the optimal treatment regimen. New, More User-Friendly Mood Chart! You can print extras of pages 5 and 6 for each following month.